The matrix switches eliminates the need to manually move multiple interface cables to display video from different sources on different screens. With the switch, any input can be directed to any output, making it ideal for point-to-point to multipoint applications. 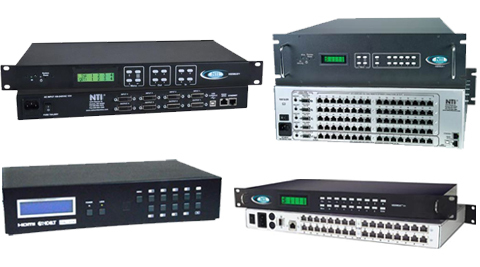 The matrix switch strongly suits use in: broadcast rooms and studios, digital signage administrative consoles, conference rooms and corporate theaters, multimedia and TV instructional applications, healthcare, hospital, and R&D imaging applications, educational classrooms with a mix of digital source devices, government multimedia command centers and control consoles.